Where does it come from? What does the name mean? 1957 - Professor Giovanni Bonatti published an article mentioning the need to save the CANE CORSO breed. 1970 - Breed recovery begins. 1980 - The recovery process for the CANECORSO begins as others take an interest in the breed. 1983 - Dr. Breber and five others from SACC The Society Amatori CANE CORSO. Dr. Giovanni Ventura developed a summarised breed standard that was published in iI CANE CORSO. 1985 - The CANECORSO breed is officially introduced to ENCI. 1987 - ENCI approves the standard for the CANE CORSO. 1988 - A survey was done on more than 50 CORSO from several different locations throughout Italy to compare their resemblance to the newly proposed standard. ENCI was then presented with the results. 1990 - ENCI allows Open Book Certification for adults that are consistent with the standard. A total of 561 CANE CORSO were certified by ENCI approved judges. In order to be approved, the dogs had to be inspected by two ENCI certified judges. Pups born from two certified parents were eligible for registration in Open Book as well as any offspring born from these dogs. 1991 - ENCI recognises the CANE CORSO as the 14th Italian breed. 1996 - The CANECORSO is presented to FCI and is recognised on an international level. 2003 - ITACOR Australian registered breeders, of the CANE CORSO present the CORSO to the ANKC (Australian National Kennel Council) and became officially recognised as the 52nd pure breed in Australia. ITACOR presents the breed to NZKC (New Zealand Kennel Council) receiving official recognition throughout Australasia. ITACOR Kennels stands amongst the worlds most elite breeding/show exhibit kennels on a global level. ITACOR are the pioneers of the breed througout Australasia. 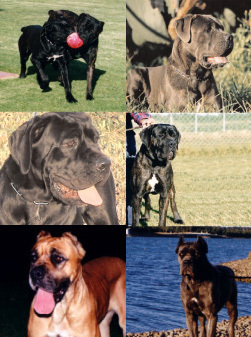 Itacor is an Australian registered breeder of the Italian CANE CORSO. We are a family that loves animals, our children have grown to admire and cherish this unique rare breed from the first day they became part of our extended family. Itacor first became aware of this rare breed 15 years ago. 1996 - Wanting to import the breed to Australia the process began. We wanted to import the best of the breed. Therefore allowing us to produce the quality of a pure breed with the best appearance, temperament and health. 2000 - Itacor obtained and imported their first pure breed Italian CANE CORSO from Champion bloodlines in Italy. Itacor commenced correspondence with the ANKC to have the Italian Cane Corso registered and recognised in OZ. 2002 - Itacor produced our first litter. 2003 - Itacor presented the CORSO to gain ANKC (Australian National Kennel Council) approval and recognition. The CORSO gaining official approval and became the 52nd pure breed in Australia and placed on the Main Register with NZKC (New Zealand Kennel Council) following. Our passion, dedication and thorough enjoyment of the CANE CORSO has been reflected on the wonderful nature our puppies portray. We have made it possible for every Australian to acquire this beautiful, strong but elegant dog to be part of your life and the whole family. Whether it be for the purpose as a show dog, family pet or personal protector the CORSO is sure to give the ultimate pleasure as your companion for life. 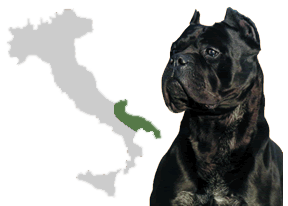 The History of the Cane Corso can be followed almost hand in hand identically to the history of Italian people themselves. They are a direct ancestor of the large Roman Molossin, which it is believed two distinct type of dog developed from. The larger, slower breed we know as the Neapolitan, and the more agile coursing dog, which has become the Corso. Latin origins: Cohors = Guard of the courtyard. The earliest mention of Corsos dates from 1137 in Monopoli di Sabina where sketches were found on the walls of the military kennels. Poems dating from around 1500 detail the Corso in a light manner, emphasising their role in protecting their owners. There are also several written proofs of their role in police duty, the earliest which dates back to 1750 where a regional regulation forbid the use of Corsos to track fugitives from justice. Despite the Roman empire Italy has been predominantly a poor country until very recently and it is this factor alone which determined what dog people kept as any animal which had to be fed had to earn its keep. The choice of dog was always an economic one. The Cane Corso is the best evidence of this theory and one which highlights such qualities. From a Roman wardog, Hunter and protector through the ages it is still used in some parts of Italy today for that very purpose. It takes a special kind of dog to be all the above and still remain a balanced and loyal companion. The Corso is an unyielding protector, who protects without hesitation and with incredible force. Corsos were very popular within the farming and hunting community of Italy until the early 1900s where the disappearance of game, and the use of firearms to protect saw the decline in numbers of this superb animal.